Last Friday, I was rudely awakened by a semi trailer outside my shed, at 6:30AM. I wasn’t expecting it before 10AM or so, but the driver had left the depot at 3:30AM, and ta-dah……. there he was! Loaded with nine out of the twenty four pallets of concrete blocks destined to go into the new build. It’s amazing how quickly one is able to jump out of bed and throw on some clothes when duty calls…… Luckily, this driver had more than two brain cells to rub together; he worked out the best way to approach the tricky delivery, even though the rep who was here a week earlier to plan this, never told him anything about our place……. Altogether, there are thirty tonnes of blocks to be delivered, and it could not all be done in one go apparently. The delivery alone is costing us $1000….. buying anything when you’re building always involves lots of zeroes! Last week I bought $4000 worth of Hoop Pine plywood from South East Queensland for the ceiling. It’s the closest thing to white wood I’ve ever seen. Amazingly, the young man who served me worked at the Noosa office where I used to buy plywood for the last house… small world! The way the pallets are unloaded off the semi is really clever. They use a three wheeled (and three wheel drive) forklift which permanently resides on the truck. To get it off, it lifts itself off the tray, slides backwards until clear of the trailer, then lowers itself to the ground….. I had no idea of whether these gadgets were able to be driven 500 metres return on a dirt road or not, but that was no issue. Included in the load were sixty litres (with more to come I think) of waterproofing additive for the mortar that ‘glues’ the blocks together…. while discussing this with the driver, he then informed me that the entire load of blocks has this stuff mixed in at the time of manufacture. Because they are destined for a retaining wall, which needs to be as waterproof as possible, for obvious reasons in our case, Island Blocks decided to include this in the order without me knowing….. We don’t want water coming into the house in a deluge like the one we had last week, so I am mighty pleased with this. Amazingly, these blocks cost us less than the ones we bought in Gympie all those years ago, even though they were specially made for us; it’s a colour they no longer market. We chose it, because it was the nearest thing to the blocks we had at Mon Abri, which we dearly wanted to reproduce as much as possible…. Nine down, fifteen to go…..
To test this waterproofing feature, I decided to put some water on a block and see if it beaded instead of the usual absorption like a sponge normal concrete displays… and indeed, the concrete is waterproof! How I wish I had known this was possible when I built the last house…. if such a service was at all possible then. Tomorrow afternoon, a local concretor is coming for a visit to discuss the footings and slab…….. Will I be out of the ground before Christmas? Now that would be one hell of a Chrissy present! Do we have five years left…….? You may remember the articles I recently published about the twilight of the age of oil by Louis Arnoux….. well Raul Ilargi from the Automatic Earth has published them too, and this time, there’s a video to go with them. It’s very informative, and led me to understand all sorts of things, not least why the price of oil can never go back up. Basically, as less and less net energy is present in each new barrel of oil extracted, it’s simply worth less…. I was getting very enthusiastic about this presentation, right up until the end when Arnoux starts pushing this ‘green box’ of his, the logo for which appears (I now realise) in the bottom corner of all his slides. It’s called the nGeni. And it all sounds too good to be true, especially after telling us all that the economy probably has just five years left, and will grind to a halt…..
After watching it, I then googled nGeni, and found this website trying to crowdfund it. I’d love to know what DTM readers think of this, because it all sounds like snake oil to me…..
It’s been raining. Lots. So much so, nearly everyone I know here is complaining, and is over it….. One advantage of being stuck indoors is that one can get around to doing the things that don’t get done when the weather’s fine and there are holes to dig, crops to plant, or grass to harvest… like planning. No, the grass is not photoshopped, it really is that green! Just to prove the old dictum “it’s not what you know, it’s who you know”, Bernie, my new town planning friend (full of stories you would not believe…..) has put a fire in my belly, and we have been working on our planning application. I have to tell you, I had just about given up on doing this project ‘the right way’, but Bernie assures me that if you approach Council talking their language, you can just about get anything through, as long as you follow the guidelines. One of the problems I was facing is that the rezoning calls for side setbacks of 100m, and our block is only 180m wide, meaning we can only achieve the correct setback on one side, not both. No problem says Bernie…… because when you read the fine print, it says “40m if the lot is greater than 1ha (it’s 5…) or if there is an existing building set back less than this distance, the setback must not be less than the existing building”! The shed from within which I am writing this is a mere two metres from the side fence! Let me assure you, I have no desire to be that close to the boundary! After being here for over a year now, I have had a lot of time to think and foster my Permaculture Master Plan for this place, and putting pen to paper, literally, produced a rather impressive looking plan that Bernie was blown away by……. I also wrote a two and a half page document that Bernie will use as an appendix to his planning report, describing how using permaculture principles we plan to turn this farm from significant, to exceptional, and why we need to live here to realise the Fanny Farm’s full potential……. Yes, I’ve been busy, until the current deluge made digging holes and planting anything simply not worth the effort. pump must not have any leaks in it, because water pumps are not air compressors, and while they can pressurise (incompressible) water to, in the case of this pump, over 400psi, water pumps cannot pressurise air to anything over 0.25psi! The end result of any air leak is no suction, period…. after mucking around for hours, I eventually decided to bite the bullet and spend fifty odd bucks on a new 25m length of pipe, end of problem. until that is, I broke the pump…..
Eastern side of market garden fence… water water everywhere..! Well, I think it was my fault. The day before, we had our usual dose of gale force wind, but frankly I can’t see how it was responsible. Similarly, I find it hard to believe that by merely flicking the delivery pipe a few inches some 20m from the pump, could break the casing where that vertical riser in the photo is screwed to the pump…… but broken it was. I took the pump back to Hobart to see if I could claim warranty, but the shop people thought I’d be wasting my time, and the manager offered to replace it free of charge with a second hand one, within one day. Casings don’t wear out, as far as I know, so I accepted, and in no time I had the IBC atop the container full of water, at 100L/minute. With all the rain we’ve had, everything is waterlogged, and I have no idea when I will next water anything…..! Such is life. And I was panicking when I broke the outlet from the dam. It’s been overflowing nonstop for days now. The beauty of having so much rain is that I am now aware of how much water I have to deal with behind the retaining wall that forms the backbone of the new house…. The engineer specified one 100mm drainage pipe, but I have already bought two. Not taking any chances; the last thing we need is a waterfall in the house next time La Niña visits Tasmania! It has been some time since my last. I have been hoping against hope that some of our main stream journalists would have realized by now that, the growth mantra espoused by business leaders and pursued by their minions, our politicians, is not the road to prosperity but, is instead a fools errand that will eventually bring about a collapse. Mathematics does not lie. Pursuing growth is equivalent to chasing death and we are gaining on it. It is destroying the environment, poisoning everything in the ocean that we eat and consuming at an ever increasing rate all that is required to sustain us. Our politicians are crazy. Only the insane could think that growth can continue forever. Our main stream journalists, they are wimps. They are more interested is saving their jobs than they are about saving their children. Who else would sacrifice their children for the insane concept of infinite growth other than insanely pathetic wimps? Again, I urge all journalists on my list to wake the (insert expletive here) up, find your courage and do something about this mad pursuit of growth at all costs while there is something left to save. Time is short. “One day, because of the white mans’ or Yo-ne-gis’ greed, there would come a time, when the fish would die in the streams, the birds would fall from the air, the waters would be blackened, and the trees would no longer be, mankind as we would know it would all but cease to exist.” — Eyes of Fire of the Cree Indian tribe prophecy. “The exploitation at the heart of capitalism also gives rise to a wholly oppressive system that is not simply economic. Exploitation cannot function without an accompanying ideological and legal apparatus backed up by the armed might of the police and the military. I almost republished Raul Ilargi Meijer’s excellent article titled “Why There is Trump”, but I was too busy, or ran out of data or some other poor excuse. Anyhow, this new article quotes Raul’s writing so much, I no longer feel the need to. This item was lifted straight from the Automatic Earth, and because it’s written by someone with an important past, and the subject matter is critical, it needs to be shared around. The farcical US presidential election as far as I am concerned is proof positive that America is in an utter state of collapse. Let’s face it, what intelligent person would want to be in charge right now, when nobody will be willing to implement any of the solutions I at least believe are necessary? This “new” discontent, Stiglitz now says, is extended into advanced economies. Perhaps this is what Hadley means when he says, “globalization was a mista ke.” It is now threatening American financial hegemony, and therefore its political hegemony too. intelligence and in European Union diplomacy. He is the founder and director of the Conflicts Forum, which advocates for engagement between political Islam and the West. I recently wrote about the thermodynamic black hole; articles about ERoEI keep popping up in my in tray that truly baffle me…… As Alice Friedemann told Chris Martenson in the podcast I discussed in the aforementioned blog post, “everyone disagrees on what to leave in or out of their ERoEI analyses”…. This EROI graph that is making the rounds is being used to claim that solar and wind can’t support an industrialized society like ours. But its numbers are wildly different from the estimates produced by other peer-reviewed literature, and suffers from some rather extreme assumptions, as I’ll show. This graph is taken from Weißbach et al, Energy intensities, EROIs, and energy payback times of electricity generating power plants (pdf link). That paper finds an EROI of 4 for solar and 16 for wind, without storage, or 1.6 and 3.9, respectively, with storage. That is to say, it finds that for every unit of energy used to build solar panels, society ultimately gets back 4 units of energy. Solar panels, according to Weißbach, generate four times as much energy over their lifetimes as it takes to manufacture them. Personally, I think these figures are a bit on the optimistic side, yet the author has a problem with them for being too low…! Ramez Naam, who was born in Cairo, Egypt, and emigrated to the US at the age of 3 is a computer scientist, futurist, angel investor, and award-winning author, who also worked for Microsoft. Enough said? And what on Earth is an angel investor? Unfortunately, Weißbach also claims that an EROI of 7 is required to support a society like Europe. I find a number that high implausible for a number of reasons, but won’t address it here. I’ll let others comment on the wind numbers. For solar, which I know better, this paper is an outlier. Looking at the bulk of the research, it’s more likely that solar panels, over their lifetime, generate 10-15 times as much energy as it takes to produce them and their associated hardware. That number may be as high as 25. And it’s rising over time. I have seen others, like Susan Krumdieck claim that to keep our complex matrix going, an ERoEI of at least 10 is needed, so it’s interesting that Weißbach aims lower. Last week, I spoke with Bedford Hill of the Hills Group about their “Thermodynamic Oil Collapse” model. What an interesting conversation it was. Bedford Hill was the project manager of a group of engineers that put over 10,000 hours in designing their Thermodynamic Oil Collapse model. It has taken me some time to digest this new energy information as well understand the details by talking with Bedford Hill and Louis Arnoux of nGeni. Again, I will be interviewing these gentlemen on this Thermodynamic Oil Collapse model and the implications shortly. Anyone interested in reading the Hills Group work, you can go to their website, thehillsgroup.org, or check out their detailed report. The rapidly falling EROI – Energy Returned On Invested is gutting the entire U.S. oil industry and economy. Instead of the United States enjoying real fundamental growth based on increased energy consumption, we have turned to inflating electronic digits as an indication of our wealth. As I explained in the beginning of the article, U.S. energy consumption has been flat for the past six years, while U.S. GDP has increased nearly 25%, as our supposed net worth has jumped 54%. Again, this goes against any sound fundamental economic theory. We have totally removed ourselves from reality. While the Fed and Central Banks will continue to prop up the markets by printing money and buying bonds and stocks, they can’t print barrels of oil or energy BTU’s. 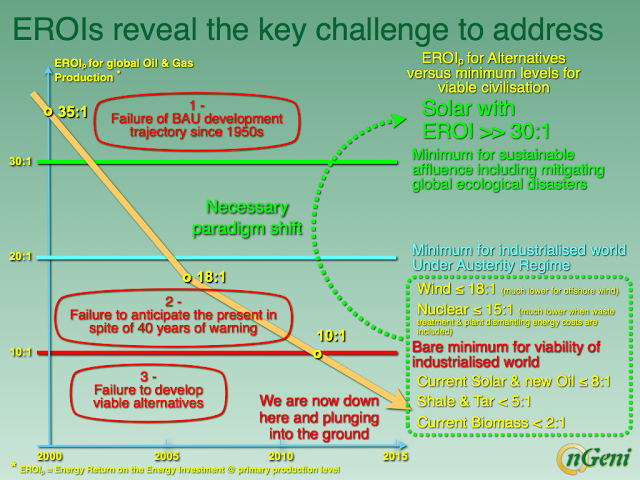 So I ask…….. how can the ERoEI of anything, let alone solar power, go up, when the primary source of energy to do all those thing, mainly oil, is falling off a cliff? This open letter to The Zeitgeist Movement replaces an essay I originally promised to Diners, “Peak Oil Revisited Part 2: Why business as usual guarantees that global industrial collapse will be complete by 2030”. I have not had the time to elucidate all aspects of my argument in detail and Dr Louis Arnoux is probably doing a better job with his articles on this topic anyway. He is a true energy expert, I am merely a lay person trying to interpret the thoughts of the experts for the general public. The other “Peak Oil Revisited” essay I promised, “Part 1b: Is an International Standardised Energy Dollar feasible?” has proved to be much more complicated than originally envisioned and is the lowest of my priorities at the moment. Even if an ISED is feasible it is unlikely to ever see the light of day for political reasons. As you know I ran sustainability meetings for doctors and scientists from 2006 to 2013. I note your Zeitgeist group is holding a meeting on sustainability on 10 September 2016. As a starting point for your discussion you may wish to display on your projection screen the letter I wrote earlier this year to “Doctors for the Environment Australia” . When I subsequently met with the Queensland DEA representative, Dr David King, he could not offer any factual or logical objections against my letter. His only comments were that although my views were consistent with those of many scientists, he felt he had to give DEA members “hope”. DEA are operating on the false hope they can fix rampant global warming which has now spiralled out of control. They have completely ignored more immediate energy and economic issues. Energy analyst Dr Louis Arnoux has informed me that world average1 EROI (energy return over invested, or to use the proper mathematical description for this ratio, energy return divided by energy invested) for petroleum fell below 10:1 a few years ago. Dr David Murphy’s figure for world average EROI of 17:1 for 2013 was an overestimate because Murphy himself wrote in his paper (published by the Royal Society) that his figure did not account for the energy costs of fuel refinement and transportation2. According to other EROI luminaries, Drs Hall and Lambert3, a ratio of 10:1 is the minimum required for a complex industrial economy to function properly. Some parts of the industrial world can continue to function at present because they have captured4 the few remaining high EROI (>10:1) sources for themselves. Others areas eg Southern Europe are losing or have lost access to such high net energy sources (“Hi-NES”)5, hence they are now deindustrialising and collapsing. The rest of the world will never industrialise. We have no significant liquid hydrocarbon replacements for conventional petroleum. Unconventional petroleum, with its woeful EROI of 3:1 or less, is an environmentally devastating scam and a stock market Ponzi scheme. Decline in Hi-NES is the primary reason for the current global economic contraction6, a fact that conventional economists are too venal or too stupid to acknowledge. The present low price of oil is deeply misleading and is hiding the fact that oil has become less affordable/available for most people around the world due to demand destruction and deflation, temporarily freeing up more oil for “lucky” countries such as Australia. Dr Jeffrey Brown’s export land model (ELM) shows that oil availability for oil importing countries will eventually fall off a cliff (see graph 1 from postpeakliving.com in which I have corrected a caption: the red line shows GROSS world oil production, which does NOT take into account the energy invested in that oil production. Hence the yellow circle is an overestimate of when zero oil will be available to oil importing countries). A more accurate curve on which to superimpose the ELM should be downslope of the Net Hubbert curve as shown in graph 2. Prior to me doing this, I do not believe anyone else has combined ELM and EROI concepts and it is high time someone did so. A most vital concept to understanding why global industral societies will soon suddenly and catastrophically collapse, just as a teetering Jenga tower suddenly collapses, is the mathematical fact that the net energy available (= energy return minus energy invested) falls off a cliff when EROI declines to 5:1 (see graph 3). Sudden catastrophic collapse is consistent with the view of Dr Ugo Bardi, one of the original “Limits to Growth” scientists, who calls this phenomenon the “Seneca cliff”. Dr Bardi is an incredibly smart scientist whose dire warnings over many years have been blithely ignored by all the stupid sheeple around him, hence he titled his blog “Cassandra’s Legacy”. In human terms, plummeting EROI in the absence of any plan to transition to a post carbon lifestyle, will mean social breakdown, war, starvation7and mass die off on a monumental scale. No part of the world which depends on petroleum will be spared. We can understand why TPTB promote false hopes for the future to the clueless sheeple, using extravagant bread and circuses like the Olympics. Such theatrics keep the herd distracted and subdued. Be assured that once the masses revolt, the drones will be deployed. On the other hand, offering intelligent people false hope for the future is in my view deeply inappropriate, especially if useful measures can be taken right now to mitigate impending hardships. Unfortunately the window of opportunity is closing fast. What is your transition plan? You may vehemently reject my warnings and choose to ignore this letter because everything seems “fine” to you now, however denial will not make a looming catastrophe magically disappear. One of your previous speakers promoted manned space travel to Mars. How useful, do you think, is that sort of meeting? IF you like further homework, I found some most interesting links on that SRSrocco website, including videos called the Hidden Secrets of Money made by Mike Maloney who was interviewed by Chris Martenson, and another articles on the collapse of the USA through analysing its disintegrating infrastructure….. Global “average” EROI of below 10:1 at present means that most oil fields now yield EROI below 10:1 (eg perhaps only 8:1 or 6:1). However there are a few oil fields which continue to yield a high EROI (eg perhaps 20:1), oil fields which the vultures are now circling. Murphy DJ. 2014 The implications of the declining energy return on investment of oil production. Phil. Trans. R. Soc. A 372: 20130126. Such capture can be accomplished by fair means (eg providing useful products to the oil vendors in exchange for their oil), or foul (eg the criminal protection racket known as the Petrodollar).